There's so much to celebrate about Yash Chopra. From painting the celluloid with dreams and beauty to delving into the dark, grey zones of the anti-social persona, his resourceful creativity in all genres and techniques has enthralled us since his directorial debut in 1959 with Dhool Ka Phool. It's only fair he should name his upcoming offering, Jab Tak Hai Jaan. One of the most prolific filmmakers of Hindi cinema turns 80 today. To celebrate this, here are 10 of my favourite scenes from his accomplished oeuvre. Set in pre-partition era, Yash Chopra's Dharmputra questions the ideas behind religion-based acrimony. Although it's only his second film, Chopra displays the competence of a seasoned filmmaker in communicating both -- the magnitude and futility of prejudice. 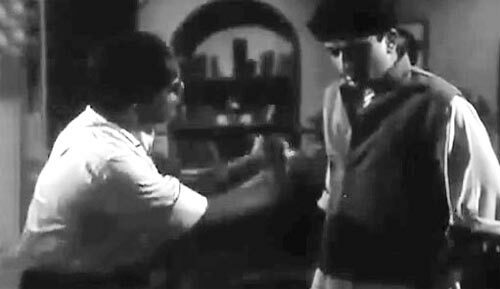 One of my favourite scenes in this film is a heated faceoff between a sensible physician father (Manmohan Krishna) and his son, a Hindu fanatic (Shashi Kapoor playing a extremist oblivious to the fact that he's actually adopted and a Muslim by birth) after the latter resents the idea of a Muslim taking refuge in their home. If only every budding bigot had a dad like this to cut him down in size. 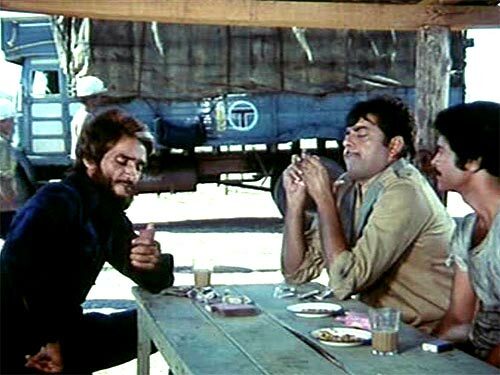 Chopra puts this approach to good use to create this immortal moment with Raaj Kumar at his scene-stealing best in the lost and found multistarrer, Waqt. Refusing to feel obliged or intimidated by Chinoy Seth's (Rehman) slighting claims or threats, the legendary actor maintains a light-hearted disposition. Next, he walks across to the nearest henchman in sight (in this case a knife-sharpening Madan Puri) and mouths these iconic words in his trademark baritone, 'Yeh bachhon ke khelne ki cheez nahi. Haath kat jaaye toh khoon nikal aata hai' and walks away with an invisible cowboy hat on an invisible horse. This is the original *cool*, kids. The enormity of the emotions and conflicts that bound and breaks Vijay, Ravi and Maa is inexplicably deep-rooted in our collective psyche. 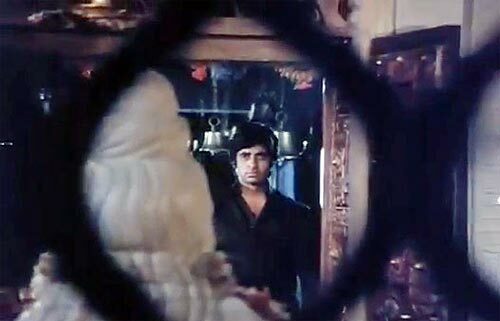 Deewar is one of Yash Chopra and writer-duo Salim-Javed's most definitive works and filled with one incredible scene after another. Personally, I feel most drawn to the one where Vijay finally decided to break his vow and step inside the temple and deliver a heartfelt appeal to the one he shares a love-hate relationship with -- God demanding him to save his, perhaps, dying mother. 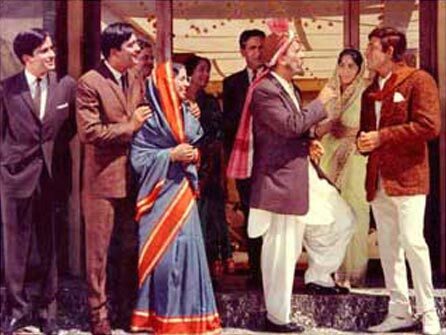 In Chopra's songless whodunit starring Rajesh Khanna and Nanda, Ittefaq solely relies on the build-up and chemistry between its lead co-stars. It's easy to lose interest if they fail to engage but the director keeps things rather interesting between Khanna's compelling fugitive and Nanda's charismatic host. This newfound understanding to coexist could strike as hugely bizarre if it wasn't for the conviction of those in and behind the scene. Speaking of 'Maa,' Chopra's Trishul has one too. And though she's long gone, Waheeda Rehman's wronged mother guides the path of where this settling of sentimental scores is headed. 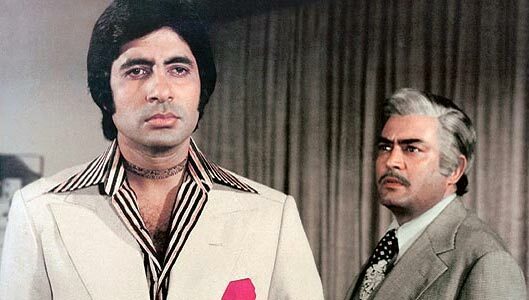 Throughout, Amitabh Bachchan's Vijay leaves no stone unturned to destroy his illicit father, or Mr RK Gupta (Sanjeev Kumar), as he is continuously referred to by him in the film. When he's finally got everything he aspired for -- Gupta's wealth, fame, extended family, he comes to visit the latter, sitting in a dark, empty room and drop that one final bomb: Main us abhagin Shanti ka beta hoon, Mr RK Gupta aur aap mere najayaz baap hain. Easily one of his most underrated efforts, Chopra's Kaala Patthar has just as much to offer as the more recognised ones. And as much as I appreciate Bachchan's silent strength and Shashi Kapoor's fervour, it's Shatrughan Sinha's swagger that gets my vote. Remember that scene where he's playing cards with Mac Mohan in a dingy tea shop while drumming his fingers to Tadbeer se bigdi hui taqdeer (Baazi) playing in the backdrop. And our man walks away with THE loot and THE line. Every single frame of Chopra's epic romance spanning two generations is elegance personified. It examines multiple aspects within a man-woman relationship -- heartbreak, compromise, refusal to let go, envy and grace. There's a stunning moment when Raakhee and Amitabh Bachchan come face to face after years since their painful separation. Although they both have gone their separate ways to raise a happy family of their own, that lingering sense of an incomplete romance lives on. Chopra's take on yet another situation where former lovers meet each other after a relatively shorter break is engaging too. 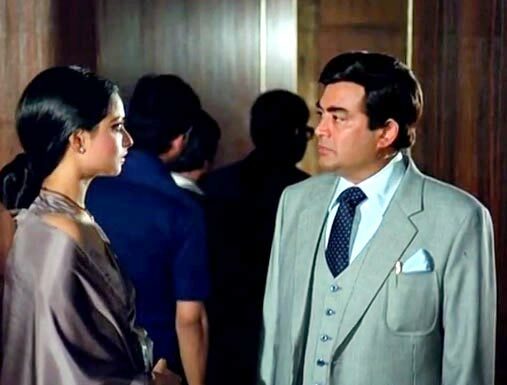 It's a tricky setting -- previously restricted to wheelchair Rishi Kapoor ended things on a rather nasty note with Sridevi forcing her to move to Mumbai from Delhi and reluctantly agree to Vinod Khanna's proposal. Oblivious to all these developments, a now perfectly fit and walking Rishi heads to surprise Sri and win her back into his life. True to his character's nature, he's charm personified and apologetic too. It's like they never broke up, the chemistry is fantastic. But it's that blend of astonishment, gladness and hurt on his visibly restrained (And so GORGEOUS) object of affection that speaks volume about this scene. One of the things I truly appreciate about Chopra's characters is just how refined they are even in the most dreadful hours. While Silsila gathered attention for casting Amitabh and Jaya Bachchan along with Rekha in a love quadrangle. It's Sanjeev Kumar's dignified stance that does it for me. Quite aware about his wife's (Rekha) indiscretions, he delicately hints her to reconsider their marriage during a lovely airport scene. He doesn't say much except make up for the lack of communication politely reminding her about the telephone bill, sick gardener's wife and urgent mail/ message and a signed cheque. But before he is 'ready for departure' he, hoping against hope, inquires if she'll be around to receive him on return. Recently in an interview to a publication, Sridevi emphasised her aversion to the climax of Lamhe. While she may not agree with it, I wouldn't have liked it to end any other way. It's also my favourite scene from this all-time favourite. After spurning off the younger Sridevi and admitting he used to be in love with her lookalike mother, Anil Kapoor realises he needs to get out of denial. Kareena, Bipasha, Vidya: The Best Heroine? VOTE!